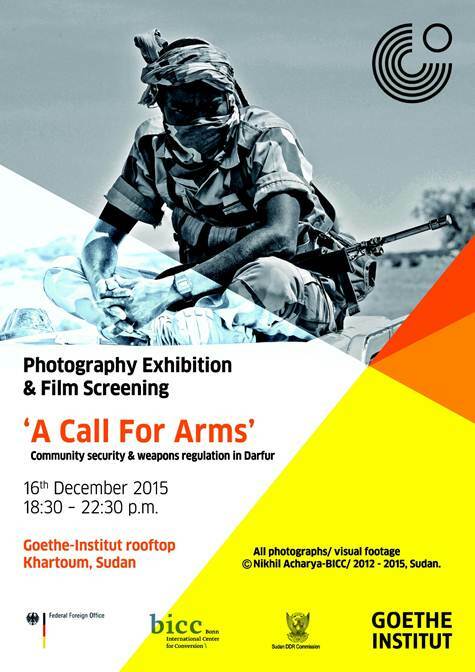 On 16 December 2015, the German Embassy in Khartoum opened exhibition “A Call for Arms” in Khartoum at the Goethe Institute followed by the film screening “A Call For Arms-Community Security & Weapons Regulation in Darfur”. The photography exhibition and documentary film provide a visual insight into three years of work on enhancing community security and laying the foundations for an arms control process in Darfur. In partnership with the Sudan Disarmament, Demobilization & Reintegration Commission (SDDRC) and supported by the German Foreign Office, the Bonn International Center for Conversion (BICC) has provided support to a civilian weapons registration and marking programme in West and South Darfur.